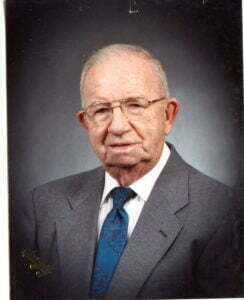 Carl C. Bogar, age 97, Went to be with the Lord on Wednesday, February 6, 2019. He was born May 10,1921 at Hardy, KY. to Joseph and Lottie Bogar. Preceded in death by his Wife of over 57 years, Viola, son, Paul Harold, parents Joseph and Lottie Bogar,and bother, Carles Bogar. He lived and worked in Detroit for 45 years. He was a time-keeper for a division of Borg Warner for 30 years. He moved to Gainesville in 1990. He was a member of the Westside Baptist Church, a lifetime member of Golden Ark Masonic Lodge # 595 in Taylor,MI. Carl is survived by his daughters; Elaine Bogar of Gainesville, and Mary (Hy)Huffman of Imlay City, MI. 3 grandchildren and 5 great-grandchildren. Family and friends will gather at the Forest Meadows Funeral Home, 725 NW 23 rd Ave,Gainesville, FL 32609 on Sunday, February 10, 2019, from 6-8 pm. A Masonic Service will be held during the visitation. The funeral Service will be held on Monday,February 11, 2019 at the Forest Meadows Memorial Gardens – Central in the mausoleum, 4100 NW 39 th Avenue,Gainesville, FL 32606 at 10 am with Reverend Carl Romey officiating. Entombment will follow services. Uncle Carl is also survived by one brother, Wilmer Bogar of Hardy, Ky. RIP Uncle Carl! Carl and my mom (Ernestine Hankins Runyon) were very close. I loved hearing stories of their antics. When we were first married and moved to MI, we always stopped at Carl and Viola’s before we went to OH to visit my parents. Such gracious hospitality. As the kids got older, it got difficult to make the extra stop. When we made a long trip to Florida, we stopped to see Carl and his “girls.” Blessed to have had him our life.